Pssssst... over here. Did anyone follow you? Are we alone? I have something to show you in my garden. 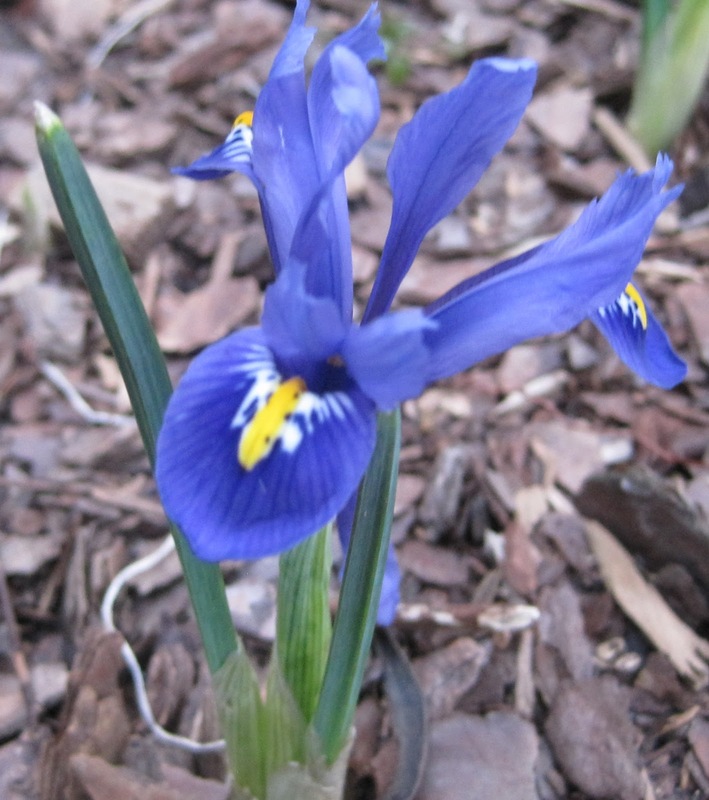 It's a tiny little iris that is blooming right now in my USDA Hardiness Zone 6b garden. It's about four inches tall, garden fairy-sized actually, and it is as blue as blue. I'm going to reveal to you the secret of how to grow this in your garden so that next March you can tell your friends you have irises blooming in your garden. They will, of course, look at you all funny like because they will immediately think of those great big bearded irises that their grandmother grew that bloom in May and wonder how you got those to bloom so early when there are still chances of snow. You will, of course, smile and say, "Not those. I'm talking about Iris reticulata, a little iris that blooms in early spring, as early as the crocus blooms." You will not say it as a haughtyculturist might, however, or this will be the last secret I share with you. Buy some Iris reticulata bulbs in the fall, plant them like you would a crocus corm, about three to four inches deep, in an area where you will see them in the spring. Then in the spring, enjoy them as some of the first flowers of the season. That's it. Plant in the fall, enjoy in the spring. You don't even need to dead head these. Just enjoy the blooms and let them die off later in the spring. Now that you know this secret of Iris reticulata, go find another gardener, show them these pretty little Iris reticulata and tell them, "You can grow that"! This post is offered as my inaugural post for Garden Bloggers You Can Grow That Day! on the fourth of every month, started by C. L. Fornari of Whole Life Gardening. Check out the You Can Grow That! Facebook page for other posts. What great advice, Carol! These little early iris are so appreciated at this time of year. Small enough for a fairy to hide under in snow or rain and blue as blue, as you say. What could be easier and more gratifying? I cannot grow those but I do love them. I'll bet the fairies do too! Very good advice Carol! Mine are up but not quite ready to bloom...Indiana is ahead of us here! Love this little Iris. Was out today checking to see if the buds were up yet. Still waiting. Hmmmm Mine aren't blooming yet. I just love these little jewels. 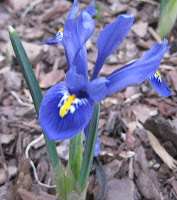 I love dainty little iris and am glad to have their bright, vivid color in the early spring. Nice post and blog! Love this! I love little hints like this shared between gardeners! Thanks! i love this Iris and blue is my fav color. As much as I love these particular Irises, I am now wondering why I don't have more of them in my yard. Perhaps I will remember this next fall!